A full spread at Little Sheep Hot Pot. Medicinal herbs (which taste a lot better than they sound) form the base for the broth. I’ve identified garlic, green onions, ginger, goji berries, and possibly jujubees, but the rest remains a mystery. 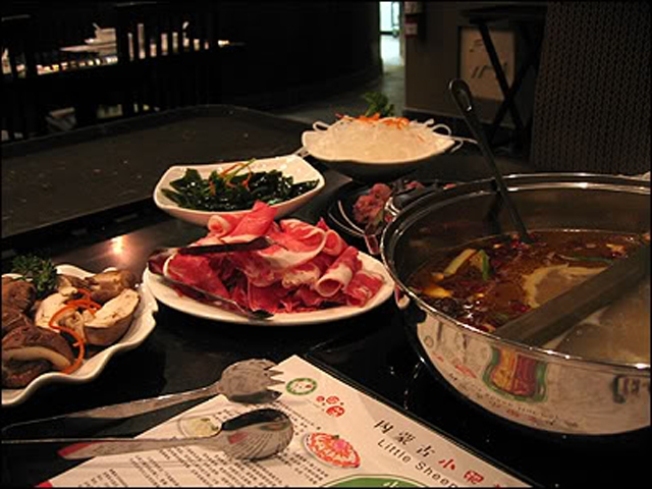 Upon entrance, visitors are immediately hit with the fragrance of the restaurant’s several vats of spicy and non-spicy simmering broths, which are brought to your table after you choose which ingredients you want to add to your hot pot. My favorites are the shiitake mushrooms, deep-fried bean curd, and lamb shoulder. The best part though? The buttery-soft garlic in the broth at the end of the meal.